The International Rugby Board has fined France £2,500 for advancing on the New Zealand haka before the World Cup final on Sunday. Les Bleus were ruled to have encroached within the required distance from the haka, behind the 10-metre line in their own half. Thierry Dusautoir led his team-mates towards the traditional war dance in a V-formation in order to make a statement of intent toward the home side. "At one stage we were so close to them that they wanted to kiss the New Zealanders, but I told them to take it easy," Dusautoir said before learning of the fine. "It was a great moment and a moment we will remember all our lives." 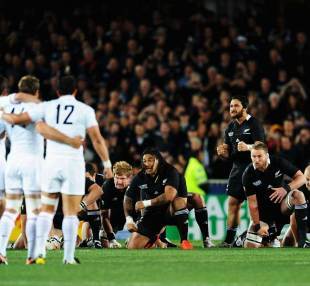 Marc Lievremont said the team tried to stop before getting too close to the haka. The France coach therefore believed a fine was a harsh penalty. "[Dusautoir] tried to stop them, there was a bit of movement bringing them forward. But a fine? I don't know," said Lievremont. All Blacks skipper Richie McCaw said his side were expecting France to make a statement as the haka took place. However, the New Zealanders steeled themselves appropriately, ultimately emerging victorious in a tightly contested decider. "We talked that they'd bring something different and they did, but the game doesn't start until the whistle blows does it?" McCaw said. "If anything, it showed us what we were in for and that's exactly what we got. They were right up for the game as we expected and they certainly made it tough." Meanwhile France lock Pascal Pape has been accused of spitting at a photographer after an altercation in Auckland on Tuesday afternoon according to TVNZ. One other photographer also alleged that they had been slapped by an unnamed French international.